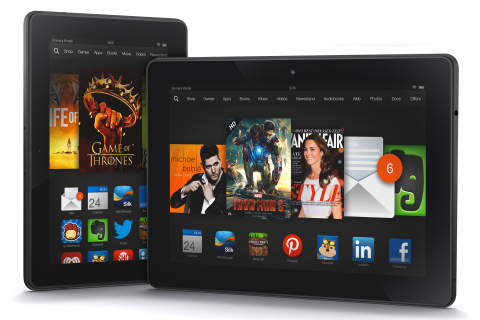 Amazon today introduced the third generation of Kindle Fire—the all-new Kindle Fire HDX. The new Kindle Fire HDX tablets combine groundbreaking hardware, the latest version of Fire OS, and exclusive new features and services like X-Ray for Music, Second Screen, Prime Instant Video downloads, and the revolutionary new Mayday button. Learn more about the new Kindle Fire HDX family at www.amazon.com/hdx. Powered by the latest version of Fire OS—Fire OS 3.0 “Mojito”—with hundreds of new and upgraded features, platform updates, andAmazon-exclusive services like X-Ray for Music, Cloud Collections, Goodreads, and more. New Mayday button delivers revolutionary live tech support—one touch connects you to anAmazon expert who can guide you remotely through any feature—24×7, 365 days a year, and it’s free. 15 seconds or less is the Mayday response time goal. Both HDX 7” and 8.9” available with ultra-fast 4G LTE wireless. Available on theAT&T network, and for the first time on theVerizon Wireless network. Front-facing HD camera makes it easy to stay in touch withSkype, plus a new 8 megapixel wide- aperture rear-facing camera on the 8.9” Fire HDX offers crisp photos and 1080p HD video. Best video experience on a tablet with newAmazon-exclusive features like Prime Instant Video downloads, Second Screen, and expanded X-Ray for Movies and TV. Deep integration with the world’s best content ecosystem—over 27 million movies, TV shows, songs, apps, games, books, audiobooks and magazines. The most popular apps and games. Apps are tested for theAmazon Appstore and Kindle Fire. Millions of books, including hundreds of thousands of titles that are exclusive to theKindle Store. Over a million titles are$4.99 or less, over 1.7 million are$9.99 or less. Over 400,000 titles available for Prime members who own a Kindle to borrow for free as part of Kindle Owners’Lending Library.